Have you ever thought about how much pollution a lawn mower puts out? Most people don’t. After all, it’s such a tiny thing. How bad could it be? Well, lawn mowers are bad. Really bad. According to the U.S. Environmental Protection Agency (EPA), a traditional gas powered lawn mower produces as much air pollution as 43 new cars each being driven 12,000 miles. Two years ago, I bought a Scott’s Push Reel Mower. And, I love it. The Scott’s Push Reel Mower is silent. There’s no annoying “lawn mower noise”. You push, and all you hear is the gentle whisk whisk whisk of the blades. My push reel mower is eco friendly. Because it’s human-powered, I don’t emit any pollution when I cut my lawn. Push reel mowers are cheap. I paid around $100 for mine. And, I don’t ever have to buy gas for it again. I also don’t have to mess with disposing of old gas by the end of the season. And, I never have to pay for “engine maintenance”. Push reel mowers are stress free. My old mower always gave me trouble when I tried to start it. And, I hated tinkering with the engine to get it to work. My push reel mower? Those beautiful blades start whirring the moment I start pushing the handle. That’s all I’ve got to worry about. Simple, and far less hassle. My garage is about the size of a shoebox. A toddler’s size shoebox. When I had a gas powered mower, it took up some pretty valuable real estate. My reel mower, however, leans up against the wall. It takes up about 20 inches of floor space. Heaven. Push reel mowers make you exercise. Instead of letting the engine do the work, you do the work. Some people don’t like this. I, however, love it. It burns calories and works my muscles. Are There Downsides to the Scotts Push Reel Mower? If you’re super into getting a pristine, golf-course quality cut for your lawn, you might not like the Scott’s push reel mower. The reason is because it doesn’t give a perfect cut. At least it doesn’t in my yard. I do have to go over the bumpy sections a couple of times to get it all cut. But, I’m not really into grass. I’m not bothered if there are stragglers here and there that manage to escape the guillotine blades. So, to me this is no big deal. But I know some people do want a perfect cut, so I had to throw that out there. Well, after a two year relationship with my push reel mower, I’m still as in love as the day I brought it home. I have nothing bad to say about it. I haven’t yet had to sharpen the blades. And, I’m never going back to a gas mower again. Hi! I have an electric mower. I am not sure if that is better for environment. It came with my house and it still works, so that since it was free I will continue to use it. Thanks for letting us know about how bad the gas mowers are. Not to mention all the oil that older gas mowers leak in liquid and gas form. That’s awesome! I’m so glad you got one. I really love mine, and am never going back to a gas mower. Thanks so much for writing in! Using a push mower makes a big difference, even though it seems like a little thing. We Have One And Was Wondering If Their Is A Place Where We Can Find A Sharpener? Dont Want To Use A File,Thanx. 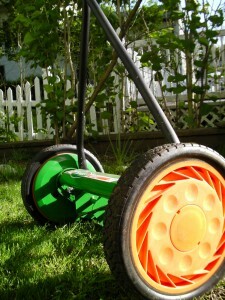 You might want to Google “push mower sharpener” and see what comes up, or check the Scott’s website (www.scotts.com). They might have other options besides a file. I was in the hardware business and sold Scotts products for over 40 years. Don’t try to sharpen a Scotts mower with a file or power grinder. The reason Scotts mowers are easier to push than other reel type push mowers is that the rotating reel and the stationary cutter bar are machined to extremely close tolerances. If you try to use a file, grinder or grinding attachment on a power drill you won’t be able get it even enough and you’ll end up ruining the blades. They do make a sharpening kit for reel mowers (google \reel mower sharpener\). The procedure involves removing one wheel, applying a sharpening compound to the blades of the reel and rotating the reel backwards. Follow the instructions carefully. This is a long process since you’re not taking off much metal at a time so be patient and keep turning. I have two reel mowers. No engine to service and better yet no engine to break down. Provides and excellent workout too. I always new gas powered lawn mowers were bad, but I guess I didn’t know how bad. We’re closing on a house soon and it will be our first experience managing a lawn. We’ve made a responsible choice to invest in a push reel mower and we can’t wait to start using it! wow? Great dude. I like your post. thanks again!!!! Hi, I bought a Scott push lawn mower for my friend, for Christmas and she just used it last week. She asked me if the blades should turn when she pulls the mower backwards? I will put the question to you. When pulling the mower backwards, should the blades turn?